Wednesday’s UK budget changed the breakdown cost of a bottle of wine again, slapping an extra 5p of excise duty on every bottle. When the budget raises the duty on petrol the price rise appears almost immediately on the pumps. When the government imposes a ‘green levy’ on energy companies, that extra cost is immediately passed on in our utility bills. So will those £4.99 wines suddenly become £5.04 when the new duty rate kicks in? Not on your nelly. The 99p price point is a sacred cow for most wine retailers, certainly the big players fighting to sell volume. The Chancellor will get his extra 5p per bottle, but you can bet your bottom dollar that it won’t come from retailers reducing their profit margin. If the price of those wines does not rise by 5p on the shelves, then just where will that Chancellor’s 5p come from? The answer is almost certainly by reducing wine quality yet again as wine buyers look to drive down the price they pay producers for the stuff in the bottle. There’s little enough quality in a £4.99 wine as it is, so squeezing more makes no sense whatsoever. Those of us who love wine should insist that every bottle rises in price by 5p. That is the only way we can preserve the quality we have. California wine exports have reached and all-time high, with U.S. wine exports (of which 90% is from California) achieving $1.55 billion in winery revenues in 2013, up 16.4% compared to the previous year. Volume shipments reached 435.2 million liters, or 48.4 million cases, up 7.5%. “Consumers across the globe continue to recognize the quality, diversity and value of California wines, despite significant trade barriers and heavily subsidized foreign competitors,” said Wine Institute President and CEO Robert P. Koch. “While the U.S. remains our largest, most important market, California exports a fifth of its wine, and we are on track to reach our goal of $2 billion in exports by 2020. The top export market for California Wines is the European Union, with 28-member countries accounting for $617 million, up 31% compared to the previous year and whilst Japan and Hong Kong were slightly down, both China and South Korea increased up 6% and 16% respectively. “We have an aggressive global marketing campaign underway that communicates California as an aspirational place with beautiful landscapes, iconic lifestyle, great wine and food, and as an environmental leader,” said Wine Institute Vice President International Marketing Linsey Gallagher. Wine consumers in Scandinavia are changing their drinking habits, according to new research by Wine Intelligence. Scandinavian wine markets are continuing to see growth in both value and volume, but tastes are changing. In Sweden, the largest of the three markets, Italian wines have leapfrogged Spanish and French wines to become the most popular choices with regular wine drinkers. Italian wines already top the chart in Norway and in Finland, and Italy is the only top five country of origin to increase its popularity in the past two years. In all three markets, consumers say they are drinking more sparkling wine, which is mainly due to a marked increase in Prosecco consumption. 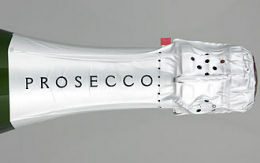 The proportion of people drinking Prosecco has risen 45% in Finland, 70% in Norway and 54% in Sweden since 2011. Globally, reports suggest that Prosecco sold 307 million bottles last year, while Champagne sold 304 million bottles, putting Prosecco ahead of Champagne for the first time. Trade magazine Drinks Business has names its top 10 spots in London for partaking of a Champagne afternoon tea – traditional afternoon tea with finger sandwiches, scones and cakes, but washed down with a glass or two of bubbly instead of Early Grey. 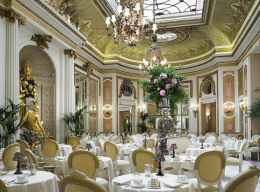 Predictably, #1 is The Ritz on Piccadily (right) where Champagne afternoon tea costs £57 per person, Claridges comes next (£61) followed by The Wellesley in Knightsbridge (£50), The Lanesborough (price not given), Brownâ€™s Hotel in Mayfair (£51.50), Fortnum & Masonâ€™s (£51), The Savoy (£59), The Dorchester (£55), The Athenaeum on Piccadily (£39.50) and The Berkeley at £51. 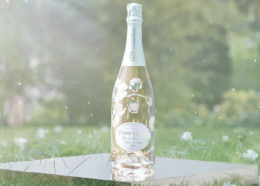 Champagne Perrier-Jouët has released a limited edition vintage cuvée designed to be ‘ephemeral’, celebrating the spring. Belle Epoque Edition Première 2007 was created by Cellar Master Hervé Deschamps who explains “This spring cuvée was conceived around a preponderance of Grand Cru chardonnay grapes – the House’s signature – selected for their freshness, finesse and liveliness. A subtle hint of pinot noir macerated in the press lends the wine suppleness and body while adding a light, cheerful color. An ephemeral cuvée to be enjoyed while the season lasts.” The Edition Première is said to pair perfectly with seasonal menus and will be available from April 2014. Those poetic French describe the Champagne as “the first rays of sunlight rippling over the vines, the delicate beauty of the first buds and the nascent freshness that awakens and delights…” The wine will be available in Harvey Nichols Bar & Wine Shop and Selfridges and will retail at RRP £240. A new trade-focused wine tasting event comes to Edinburgh, Scotland, on April 28th, when 15 top Languedoc and Roussillon producers hit town to present their wines at the city’s Balmoral Hotel. Wine-pages is an official partner in the event, and Tom Cannavan will present a masterclass on the “hidden gems of the Languedoc Rousslillon” at 16:30 on the day. The event is for wine and hospitality trade and press only and both the tasting (which runs from 13:00 – 19:00) and masterclass are free, but prior registration is essential. Contact sarah.presse@orange.fr.